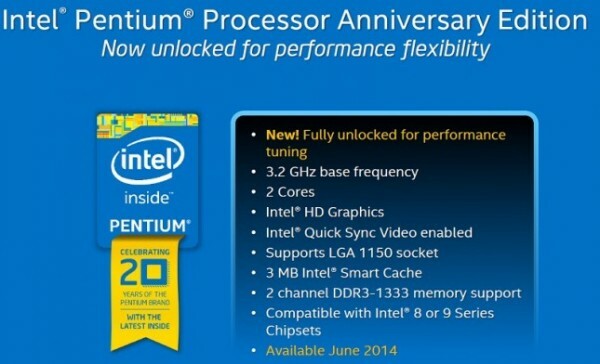 More information about the Intel Pentium Anniversary Edition has been revealed at Computex 2014. Overclocking enthusiasts will be able to get their hands on the processor meant to celebrate the 20-year anniversary of the Intel Pentium processor series that became an icon. According to slides shared with the media, the Intel Pentium G3258 is expected to arrive on 10 June 2014. The new Pentium is compatible with the LGA1150 socket, but will need an Intel Z series motherboard to use it as intended. As a 3.2GHz dual core processor it does not come anywhere near to a high powered chip, although it only has a TDP of 53W which reduces the total amount of cooling needed when overclocking. As mentioned before, it is compatible with both Intel 8 and 9 series chipsets; which gives it quite a bit of longevity. The Intel Pentium Anniversary Edition (or Pentium G3258) will be boxed with a 20th Anniversary ribbon to make it easier for customers to identify it.